The video of Rose "Osang" Fostanes, a Pinay caregiver in Tel Aviv, singing the Shirley Bassey hit "This Is My Life" during her audition on "The X Factor Israel" has gone viral on Facebook. Posted just a day ago, the said clip has attracted over 27,000 likes, more 42,000 shares and thousands of comments from the users of the popular networking sites. Many of those who commented said they are proud of their Kababayan and that she is an inspiration. "Great performance of a Pinoy in a foreign land," Facebooker Jopay Casalla wrote. "It feels great whenever I see Filipinos being recognized in international competitions... Very inspiring.. We really have an X factor.. To you miss Osang, good luck and may you win this contest.. Simple lang ang dating pero astig. 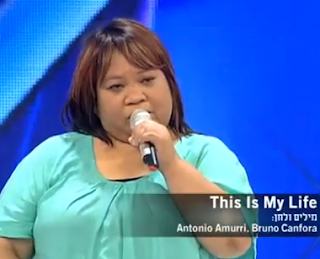 Yan ang Pinoy..."
In the video, the 46-year-old Taguig City native received a standing ovation from the audience and the four judges, who all gave her "Yes" votes.